Giovanni Giorgio Moroder (born Hansjörg Moroder in the Tyrolean town of Urtijëi in April 1940) is one of the most influential record producers and songwriters of the 70s and 80s. Frequently credited with pioneering synth disco and electronic dance music, he’s best known for his collaborations with the late Donna Summer - including the mega hits Love to Love You Baby and I Feel Love. He also founded the Oasis label and the famous Musicland Recording Studios in Munich, used by major acts including the Electric Light Orchestra, Led Zeppelin, Queen and Elton John. He worked with David Bowie on Cat People (Putting Out Fire), Blondie on Call Me and, of course, Phil Oakey on Together in Electric Dreams. As these things go he’s pretty huge. Unfortunately he also produced some utterly terrible trash. Throughout his career Moroder has exhibited a horrible habit, insisting on stepping out from behind the mixing desk to inflict his own solo efforts on an unsuspecting public. He may have an impeccable pedigree in disco circles, but the great man is no stranger to releasing rubbish. His first album, 1970’s That’s Bubble Gum – That’s Giorgio is stuffed with appalling cover versions 'sung' in broken English, such as the two Creedence Clearwater Revival tracks here, Proud Mary and Bad Moon Rising. Just dreadful. But it didn't stop there. Oh no. In 1978, at the height of the disco era - and at the height of his success - Moroder issued a dire discofied version of the Procol Harum classic A Whiter Shade of Pale. The track, from the album Knights in White Satin, is credited to the Munich Machine Featuring Chris Bennett but it’s actually a studio project from Moroder and his co-conspirator, British songwriter/producer Pete Bellotte utilising many of the musicians they had used on their various sessions. Vocalist Chris Bennett, now a respected jazz musician (born Christine Bennett in Illinois in August 1948) was a backing singer and pianist who had appeared on recordings by Tina Turner, The Manhattan Transfer and Donna Summer. She was later nominated for a Grammy for The Theme from Midnight Express. Horrifyingly this piece of rubbish was a minor hit in Britain in 1978, reaching the dizzying heights of 42 during its’ four-week run. ‘How long can disco on?’, Harry Nilsson once asked. Too long if you ask me, especially if it coughs up crap like this. Following on from the recent post from Senator Samuel J Ervin, here’s another dreadful little record this time not only made by a politician but also about a fellow politician. 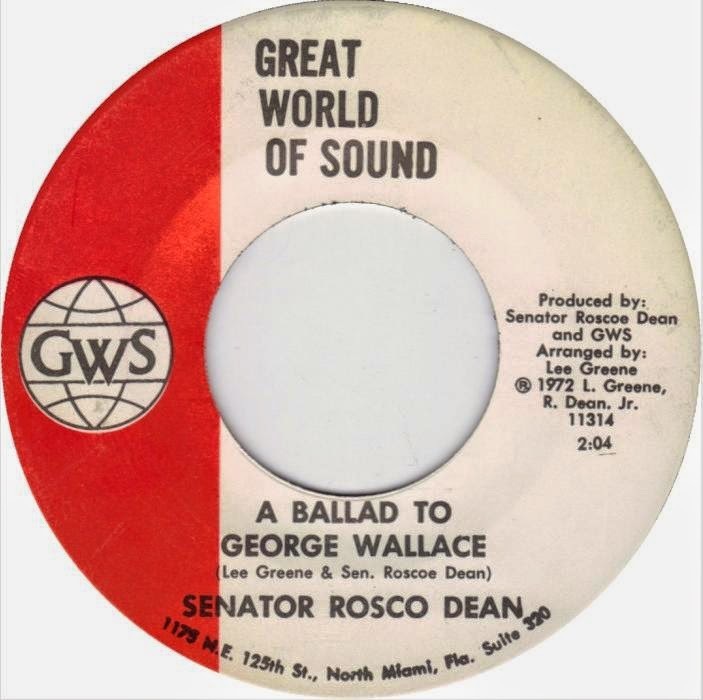 A Ballad to George Wallace by Senator Roscoe Dean was issued in August 1972 on the tiny GWS (Great World of Sound) label of Miami, Florida. Roscoe Dean Jr was the state’s youngest senator, elected to office at just 28 years old in 1963. Governor George Wallace, of course, was also immortalised in song by Ken “Nevada” Maines on the brilliantly odd album The World of Las Vegas, featured on this very blog back in July 2012 (and in the rather excellent book The World’s Worst Records: Volume One). This particular record was issues just months after an assassination attempt – in May 1972 - left Wallace paralysed, forcing him to use a wheelchair for the rest of his life. Wallace, who died in 1998, is chiefly remembered for his segregationist views, although he eventually renounced segregationism. 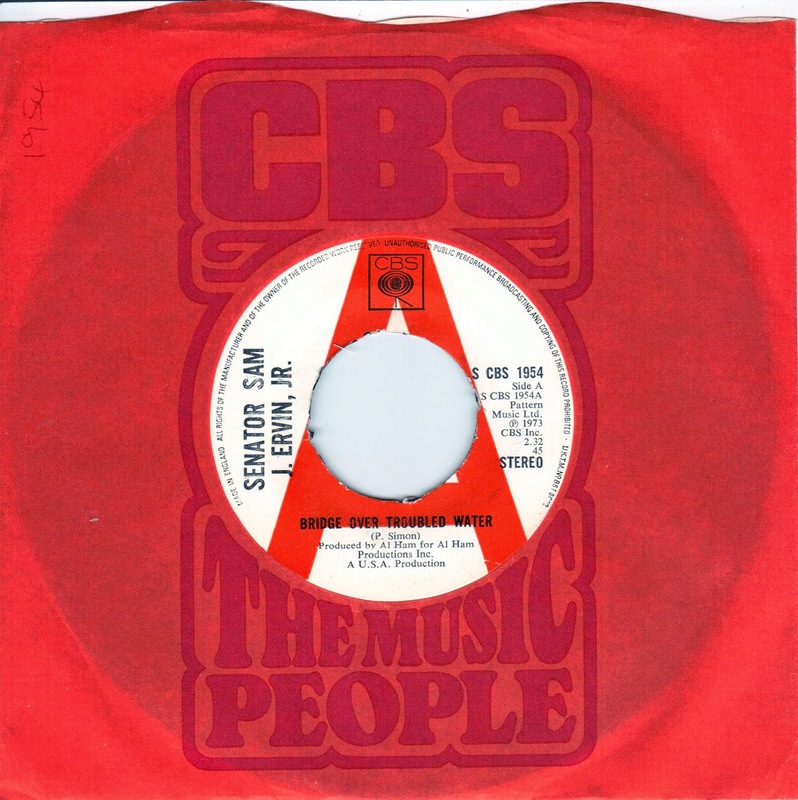 Backed with Monday Morning Blues by Lee Greene and his Shining Knights of Greene, both songs were co-written by Greene and the mad, bad Senator himself. Senator Roscoe Dean was indicted on 14 counts of theft – for fiddling his expenses – in 1975, the same year that Governor George launched his fourth unsuccessful campaign for the presidency. The good ol’ boy even took his mum to court with him to elicit some sympathy from the bench, but he was still censured (firmly rebuked) by the Senate in 1976 for, amongst other things, claiming mileage from his home in Jesup, Georgia to Atlanta on days when he was in the Bahamas. Not one to learn from his mistakes, in 1982 Dean attempted to found an illegal drug cartel on the Georgia coast to finance his campaign for governor; unfortunately for him his Colombian drug-running co-conspirators were actually undercover agents from the Georgia Bureau of Investigation. Roscoe Emory Dean, Jr. and John Thomas Bigley were convicted after trial by jury on three counts of conspiracy to import cocaine, marijuana, and methaqualone; Bigley was convicted on one additional count of using a firearm in the commission of a federal felony. It has even been suggested that he may have been capable of murder: in December 1979, it is claimed, attorney Hirsch Friedman was contacted by a Mr. Weiss, who had been sentenced on a felony conviction in federal court. Weiss stated he had information that Roscoe Dean was involved in a plot to kill Governor George Busbee. Weiss's information was conveyed to the Georgia Bureau of Investigation and the GBI asked Friedman to do undercover work on the investigation into Roscoe Dean’s nefarious activities. Friedman was wired up to a concealed tape recorder and, posing as a drug smuggler, discussed the possible sale of cocaine with the Senator. Mr. Friedman then arrested him. Roscoe was arrested and sent to prison for five years. Released on petition after 22 months, his appeal was overturned and he returned to prison in 1985 to serve out the remainder of his sentence. He's still, apparently, living in Jesup today. I'll bet people give him a wide berth when they meet him on the street. Anyway, here’s Roscoe’s attempt at vinyl immortality. Enjoy! Today’s selection comes from a batch of 45s which recently came my way via my good friend The Squire, whose wonderful podcast The Squire Presents ( thesquirepresents .podbean.com ), is essential listening for anyone interested in obscure, obtuse and downright bonkers music. A couple of days ago he was kind enough to send me a load of singles, several of which I will feature over the coming weeks. 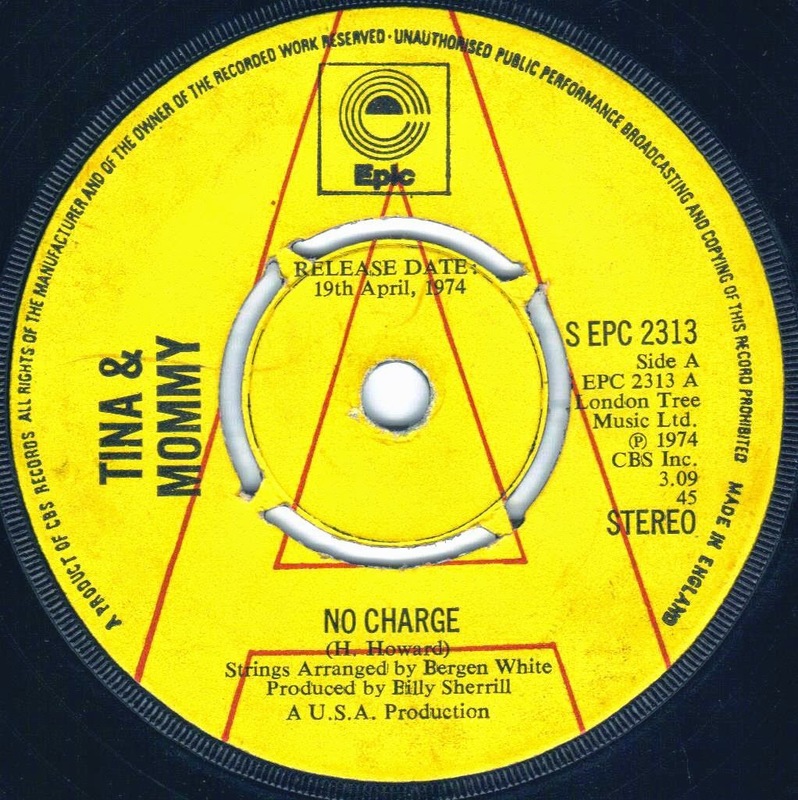 The first is this piece of dross, issued in 1974 by Epic Records: Tina & Mommy with No Charge, backed with The Telephone Call by Tina & Daddy. The A-side is a cover version of the awful, maudlin piece of schlock that was originally recorded by Melba Montgomery, but is probably best known here in the UK for providing J J Barrie with a Number One in 1976. The flip is an original song, co-written by producer Billy Sherrill – who also co-wrote Tammy’s huge hit Stand By Your Man. Both songs and performances are horrible. I better not Daddy, she's too upset about the fire! Mommy, I think Daddy just called you a liar! Vile! Talky Tina is no singer, although Mommy and Daddy sound accomplished and rather familiar. And so they should, for Mommy is no less than First Lady of Country Tammy Wynette and Daddy is her second husband, the legendary country alcoholic George ‘No Show’ Jones, who I’ve featured on this blog before with the hideously racist The Poor Chinee. Both sides of this 45 would appear on the couple’s 1975 album George & Tammy & Tina. The "Tina" is Tina Byrd, Tammy’s eight-year-old daughter, who George adopted along with her sisters Gwen and Jackie shortly after the birth of his and Tammy’s own daughter Tamala Georgette. Neither the single nor the accompanying album charted in the UK, although TheTelephone Call made Number 25 on the US Country charts. George and Tammy had what can only be describes as a tempestuous relationship. He drank heavily, played with guns (shooting up their home, according to Wynette) and more than likely physically abused her (it’s been claimed that all five of Tammy’s husbands knocked her about, although Jones reputed this). She, with a history of real and imagined health issues, took so many prescription drugs – becoming addicted to pain killers - that she must have rattled worse than Elvis. That legacy lives on - the Wynette children have been involved in a long legal battle over their inheritance since Tammy passed away in 1998: first with their step-father (and Tammy's fifth husband) the singer-songwriter George Richey and, since his death in 2010 with his widow Sheila Slaughter. Tina had had a pretty rough ride herself: born prematurely, she spent the first three months of her life in an incubator. Shortly after she left hospital for the family home Tina was diagnosed with spinal meningitis and spent 17 days in an isolation unit. She eventually spent seven weeks in the hospital before beating the disease. It’s little less than a miracle she was able to sing for us at all. Tina, although feted by sister Georgette as ‘the one with the voice’, decided not to continue with her recording career. ‘Tina and I travelled with Mom as harmony singers,’ Georgette wrote in her book The Three of Us: Growing Up With Tammy & George. ‘Tina was a wonderful singer, by the way. It always surprised me that she didn't go on to have a career in music, because she certainly had the talent.’ Whilst I appreciate her loyalty to her sibling, I think that anyone who hears this particular record will have cause to disagree. A few weeks back I introduced you to some of the later work of composer/producer Paul Vance, the man whose career began with the huge hits Catch a Falling Star and Itsy Bitsy Teenie Weenie Yellow Polka Dot Bikini and ended with the massive, but dreadful, Playground In My Mind and Without Your Love (Mr Jordan). 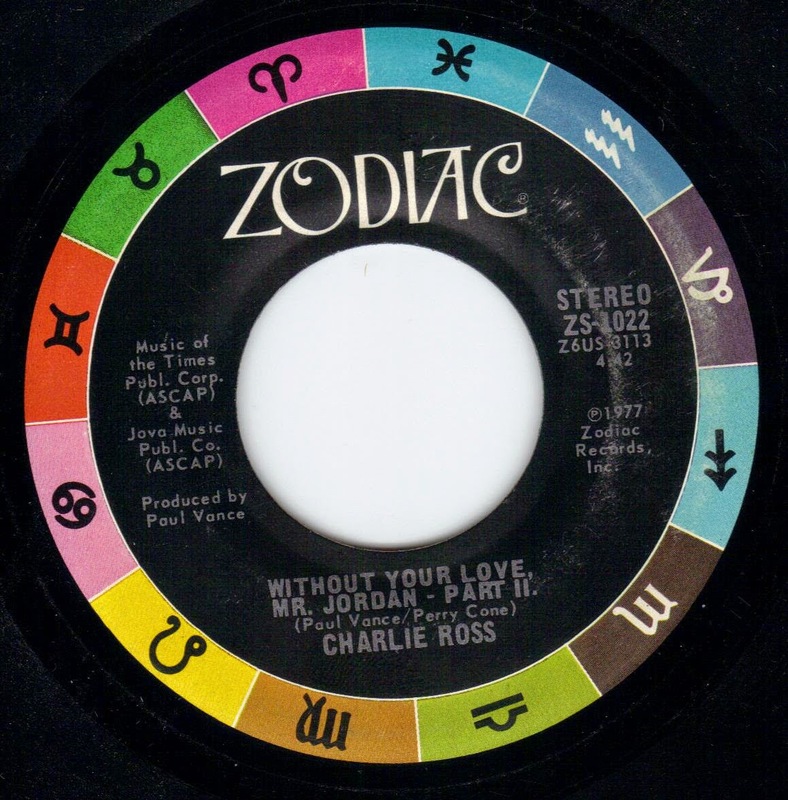 Without Your Love (Mr Jordan), is a revolting song recorded by singer Charlie Ross – who had previously been the bassist and singer of the moderately successful 60s group Eternity’s Children - about a couple who on the surface appear to be deeply in love with each other but who, the listener soon discovers, are both conducting illicit affairs. This horrid record reached Number 42 in the US charts (but went to Number 13 in the Country Music listings) and its success inspired Vance and his co-writer Perry Cone to pen a follow-up, Without Your Love, Mr Jordan - Part Two. Issued a year later, as the B-side to another Vance co-write Lady Loretta, this time the disc failed to chart. But here it is, and it’s even more ghastly than the original. I've included Lady Loretta as well: although it's rubbish it's nowhere near as godawful as the flip. Like the original it’s a duet; again like the original the featured female singer is uncredited. We know that Vance had a habit of pulling in the various members of his family to sing on his productions, but as far as I am aware this is not one of them. Whilst in Eternity’s Children Ross was accompanied on vocals by Linda Lawley; although at this stage I cannot confirm if the singer is her or not, perhaps someone reading this will know. maybe we'll find out when Paul Vance issues his autobiography later this year. American politician Samuel James Ervin, Jr. (born September 27, 1896) served as the Democrat Senator for North Carolina from 1954 to 1974. He was instrumental in bringing down two powerful opponents: Senator Joe McCarthy at the very beginning of his career and President Richard Nixon at the very end. In 1954 Nixon, then vice-President, appointed Ervin to a committee formed to investigate whether McCarthy should be censured by the Senate. It was Ervin's investigation of the Watergate scandal in 1972/73 that lead to the resignation of his former mentor. However, although there is little evidence to show that the man was involved in any lynchings himself, in 1956 he helped draft The Southern Manifesto, which encouraged defiance of desegregation and was signed by most the Southern members of Congress. His apologists argue that his opposition to most civil rights legislation was based on his commitment to the preservation of the Constitution, and that he also supported civil liberties by opposing "no knock" search laws, the growing intrusions of data banks and lie-detectors (a machine he branded '20th century witchcraft'), the use of illegally-seized evidence in criminal trials, and he played a major role in the defeat of a Constitutional amendment to make prayer in public schools compulsory. So he wasn't all bad, then, or all good. Like most of us. A native of Morganton, North Carolina, he thought of himself as a "country lawyer", and was well-known for telling humorous stories in his Southern drawl. It was this particular party piece that led Columbia Records to sign him up. His one album - Senator Sam at Home - featured Sam speaking his mind, telling a few anecdotes and occasionally bursting into song: evidence of which managed to cross the pond when CBS in the UK issued Bridge Over Troubled Water as a single in 1973. The track was later re-issued on the Rhino compilation Golden Throats 2. Senator Sam at Home was, apparently, recorded in the library of his Morganton home. I fail to understand what was going on in the mind of the CBS executive who thought that this drivel stood a chance of being a hit in Britain. The man was famous in the States, of course he’ll sell a few copies, but here he was an unknown septuagenarian doing little more than reading a poem – badly. When performed with emotion, Paul Simon’s Bridge Over Troubled Water is a great song: recited in stumbling fashion over a hokey backing just doesn’t cut it. Scheduled for release in the UK in November 1973, all of the UK copies I have seen have been promos: it’s possible that the disc was so poorly received that stock copies were never issued here. In America the album was supported by full-page ads in the trade papers which waxed lyrically about Sam’s ‘insights into Shakespeare, the Constitution and the Bible’. William S Burroughs even wrote about the album in Esquire. Sam Ervin retired from Congress in December 1974. he continued to practice law, and his son and two of his grandsons followed him into the legal profession. He died from emphysema on April 23, 1985, aged 88. Here’s Senator Sam ghastly version of Bridge Over Troubled Water. I’ve also included the 45’s B-side, Zeke and the Snake.